Spring is just around the corner and while I sit inside during what I hope is the last snowstorm of the season, I wanted to take some time to say hello and fill you in on what's new around here. Hopefully you're gearing up for the hatching season, if you haven't started already. We have been adding some Featured Breeders to our Breeder Directory and have a new way to design the ad so if you'd like to promote your website or your breeds and take advantage of all the traffic we've been receiving at our breeder directory, please consider this advertising opportunity. We'll create an ad for free! It's only $10/month and the directory pages average about 4,000 visitors/month. Let us know if you're interested. We have a new page for Poultry Workshops and Events. If you know of an informational workshop about raising chickens, either backyard or exhibition, let us know and we'll add it to the list! 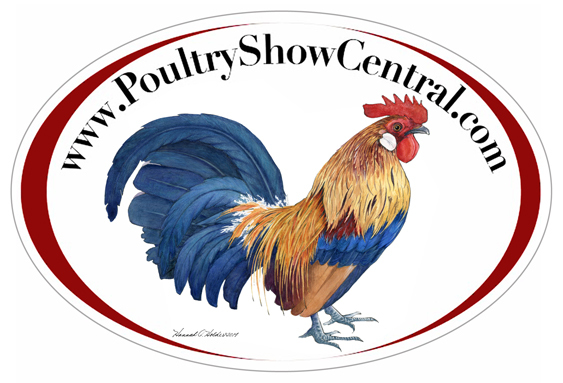 We are excited to announce that we will soon have available an updated oval car magnet with our awesome original watercolor rooster logo painted by Hannah Holder and modeled after our Dutch Bantam rooster for just $5. They will be available via the website or in person at shows in the coming weeks. Use it for your refrigerator or dress up your car! I will send out a special email update when they are available or you can pre-order here. If you benefit from the use of our website, this is a great way to show your support. We look forward to hearing from you regarding any 2015 dates not yet updated on the website. As always, any comments, new information and especially any corrections are welcome! Kevin, Valerie and Kara Miller Email Us!